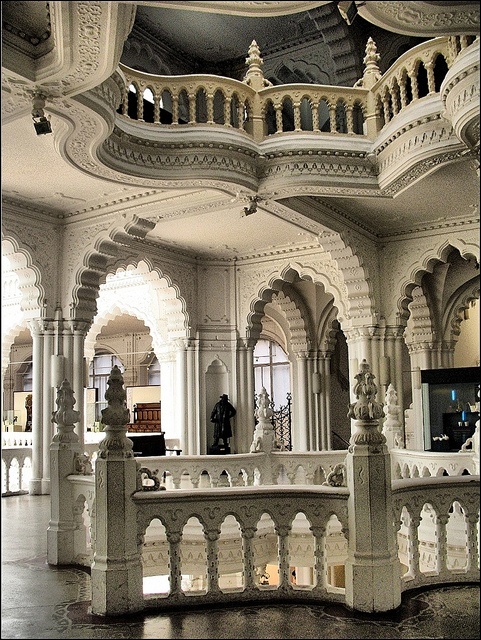 The Museum of Applied Arts (Magyar Iparművészeti Múzeum in Hungarian) is a museum in Budapest, Hungary. This Art Nouveau building was built between 1893 and 1896 to the plans of Ödön Lechner and Gyula Pártos. It is one of the most characteristic and most representative forms of Lechner's architectural style, featuring Hungarian folk ceramics, including Zsolnay pottery and majolica, also showing Islamic and Hindu motifs (another example of this style is the Geological Institute not far from City Park). The Museum of Applied Arts has a rich collection of European decorative arts, arranged in the following collections: Collection of Furniture, Collection of Metalwork, Collection of Textiles, Collection of Ceramics and Glass. In addition, the museum has a public library collection. The Museum of Applied Arts has two branches: The Hopp Ferenc Museum of Eastern Asiatic Arts and the Nagytétény Castle Museum. The permanent exhibition, Collectors and Treasures, presents pieces from the museum's collection. Works of art illustrate the founding and history of the museum, as the exhibition deals with the most important stages in the history of the museum, beginning from 1872. The museum is located near the southern end of the Grand Boulevard in the neighborhood Ferencváros and it can be accessed by metro line 3.